Gone are the times where archers rely on their skills alone with the traditional bow and arrow to hunt. Today, there are innovated modern arrows that ease up your burden even if you’re a newbie to this sport. Compound bows, for instance, are equipped with various accessories that help you reach your maximum potential. Owing it up to your skills alone is one thing, but in reality, it’s reserved to experienced archers who have been shooting arrows for several years. But how about newer archers? This is where the best bow stabilizer comes into the picture. Should You Get A Bow Stabilizer? From earlier, there are several bow accessories that add up to the stats of your bow. There are bow sights to hit your target and make you see at night. There are also bow stabilizers that act as stabilizers. But how do these bow stabilizers balance your bow upright at full draw? 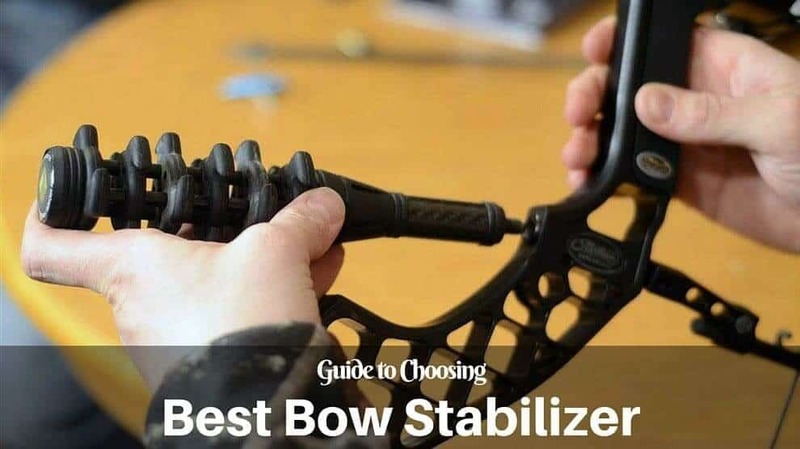 How to choose a good bow stabilizer? Check out this article for answers about the best bow stabilizers that are currently available and how do they affect your accuracy. Trophy Ridge is one of those brands you can trust with bow accessories. It is no different with bow stabilizers. 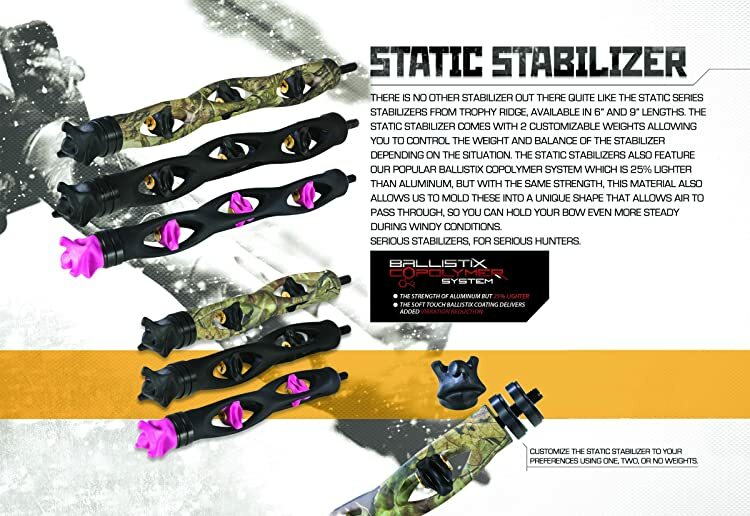 In fact, this stabilizer made by Trophy Ridge is one of the best bow stabilizers you can find with a low cost. Its low cost doesn’t deter its attributes like accuracy. The Static Stabilizer is made in an ultra-lightweight material called the Ballistix CoPolymer System. This is why this stabilizer is 25 percent lighter than aluminum, but still as durable in strength and various conditions. Aside from that, because of the material, the design of the stabilizer is unique. Unique because it has holes that make air pass through easily that makes it steadier in windy conditions. And also, it has shock absorption attribute. Because of its feature that comes with two customizable weights, you can adjust the weight and balance of the stabilizer at your will. Because of the weight, it is suitable for accurate shots. With the weights on, the weight would be at 8 oz. While its length at least 6 inches. It is perfect for hunting because of the camo design and the rubber that quiets the bow’s vibrations! It comes with a braided wrist sling, and you can still get a hold of your bow even if you’re not carrying it. 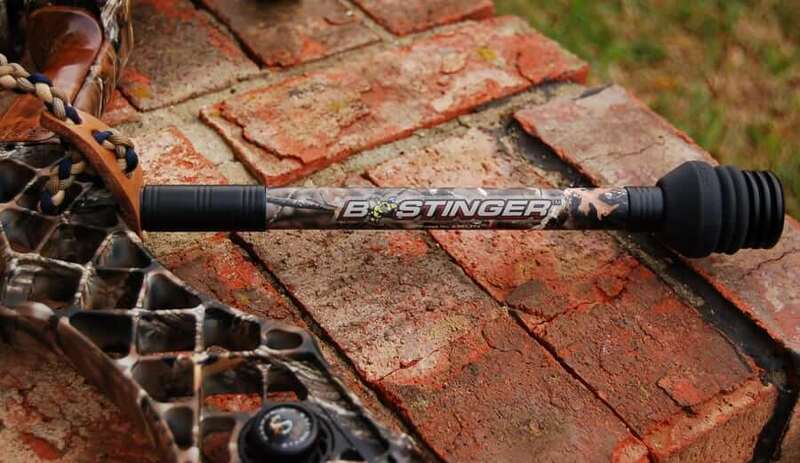 Through testing and research incorporated into stabilizers, the company Bee Stinger provides archers with a premium collection of stabilizers that suit a seasoned archers needs, and money can buy. One of their products is the Sport Hunter Xtreme that is renowned for its stabilization and vibration reduction. Sport Hunter Xtreme is made out of ultra-light carbon fiber rod that makes your stabilizer rigid and steady when an arrow is released. Its construction has integrated SIMS Internal Harmonic Dampener and the De-Resonator component that eliminates the vibration on your bow. Aside from that, its weight is positioned to the furthest point from your bow and can garner a maximum moment of inertia. The balance the gives to your bow makes your pins steady for aiming. The weights are definitely customizable because you can add or remove the three weights made of aluminum caps at 1 oz each. The length you can choose from range from 6 to 10 inches, and you can increase 0.5″ for each length with weight included. The weights for each length also vary. And to further satisfy your preferences, this stabilizer come in a wide array of colors! This is also part of the stabilizers made by Bee Stinger that you can install to your bow and notice the tremendous effects that will make sure you buy another one for your mate as a gift. Bee Stinger’s patented design brags about downrange accuracy and stability when you come to full draw. 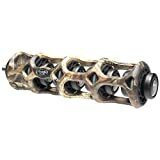 Like Sport Hunter Xtreme, this Pro Hunter Xtreme stabilizer is also made of ultra-light carbon that is real rigid that allows you to fully use the end weight. Its end weight is fully capable of maximizing the moment of inertia to resist hand torque. With its Smart Carbon Technology, the overall rigidity and stabilization are at their maximum stats, providing the archer a greater shot in accuracy. 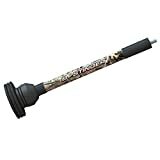 Like the Sport Hunter Xtreme, this product has assimilated internal harmonic dampener and de-resonator that surely cancel out the vibration from your compound bow. Like the other model by Bee Stinger, this product has three individual end caps made of aluminum that you can customize depending on your preferred balance. Pro Hunter Maxx is sold in different lengths. 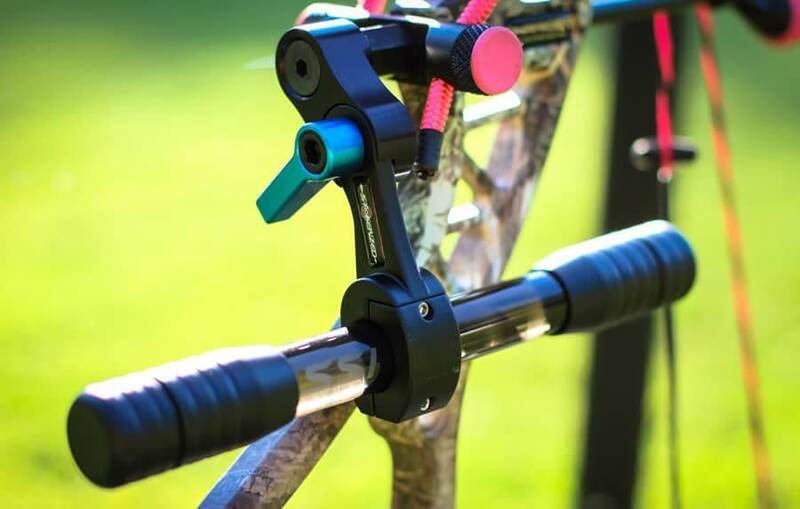 If you want to have absolute control on your bow, you’ll want to try with Pro Hunter Maxx Stabilizer and see the steadiness it gives whether you do a draw or a release. New Archery Products has an Apache line that features both solid construction and stealth qualities. In fact, it’s raking in positive reviews from its users because of its better control on their bows. Another reason why it’s popular is that it performs as advertised. Thus, their money is deemed well spent. The great thing about this Apache is that it is originally sold at 8 inches, however, if you wish any shorter length, you can remove the extender down to its base mount at 5 inches. It is said that the 8 inch is good for target shooting, and the 5 inch is perfect for hunting. The removable carbon fiber rod at 3 inches weighs 2 oz. and is perfectly capable for its versatility and balance in any situation. The overall weight is up to 7.5 oz. and works well for better accuracy. Apache stabilizer has dampening materials that make your bow quiet when you do a full draw and a quick release afterward. The color comes in either black or camo. SSG stands for Silence Second Generation. From its name, Axion SSG is definitely a silencer in the works because it has Mathews that is proven to be a harmonic dampener and a stabilizer too. The 4-inch stabilizer body has three sections that allow three Mathews to be placed inside. The 6-inch stabilizer can fit four Mathews that help cushion the vibration. It’s actually well thought by EBBQ’s engineers because of its construction and the cool design. This four inch/6 inch and 6 oz./8 oz. 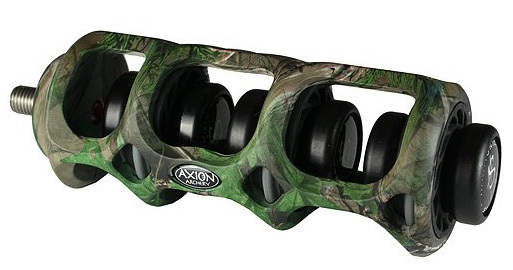 Axion stabilizer offers vibration elimination with of its lightweight design and the Mathews made of rubber. It’s obvious from its length that this is very capable in a hunting setting. It also comes in colors that will blend well in a hunting surrounding like woods. This product’s main advantage is that it is CNC machined designed that makes 80 percent less wind resistance and because of the maximum moment inertia, the chances of hand torque is reduced. Though this is a newer product than the previous products listed, it is surely worthy to check this out! As an archer, there are times that vibration from your shooting will affect your success rate and ability to hit your target, or prey if you’re a hunter. One of the key purposes of bow stabilizers is to eliminate that vibration and the noise when you fire an arrow. Despite its function as a vibration dampener, it’s not the main reason why it’s called a stabilizer. To answer the question, they are stabilizers because they keep the bow steady and lessen the movements when shooting. A stabilizer will evenly balance out the weight of your bow. The vibration reduction and the steady bow function both affect the accuracy of your shot. There are archers that struggle between getting a bow stabilizer or not. Some don’t even have it. Though it’s not a question for target shooters in a competition, it is for a bow hunter. That because for competitions, a long bow stabilizer helps the archer to balance the bow. Its length helps you to land your arrows. If you’re a hunter in the woods, all the more reason to get a bow stabilizer. For example, if you’re in a 30-yard radius and you try to shoot up prey. By that distance, they can hear the vibrations when you fire an arrow because they have excellent hearing and run away. If you want to be as quiet as possible and as accurate as possible, you will consider yourself buying a bow stabilizer. This is a more detailed section on how a bow stabilizer reduces the vibration of your bow. There are archers that think that when they fire an arrow to their prey yards away, it will then be too late for the prey to notice the sound because they will then be hit. However, this is a mistaken notion. If you think about it, the fastest speed that an arrow from your compound bow can travel is a little more than 300 feet per second, and the speed of sound is at 1125 feet per second. It is evident which of the two will first reach the prey’s ears. Vibrations are caused by your bow when you steady yourself to fire an arrow. It is because not all of the energy from the tension of the string of the bow goes with the arrow when you release the string. The arrow flies and the energy that has remained to the bow will cause vibration that can cause you to modify your hand position, and your arrow may have decreased its probability of hitting. Vibrations and noise course throughout your compound bow. From the upper and lower limbs to the string that vibrates to produce high-frequency reverberation. The role of the bow stabilizer is necessary for this situation. It has the capability of being a dampener and can quiet your bow immensely. 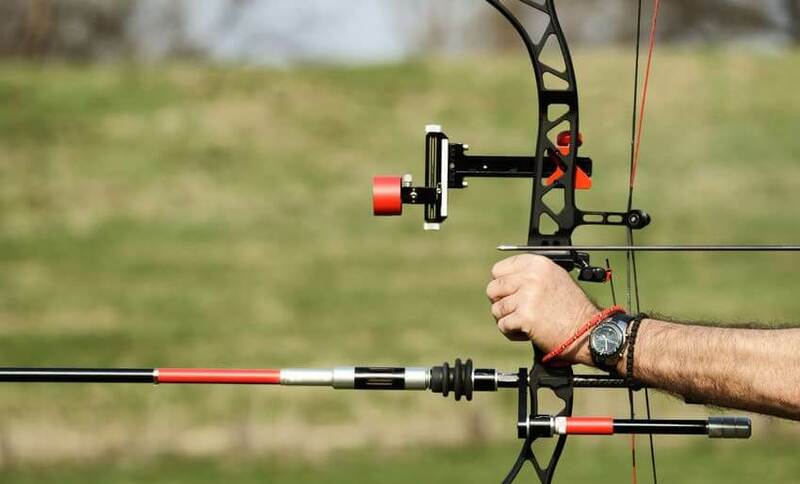 If you install a bow stabilizer, your hand will stay in position, and you will achieve greater accuracy. A longer and heavier bow stabilizer will give you the much-needed stability when you do target archery. Bow stabilizer adds forward weight to the compound bow that can make you stay on your target because the weight pulls down the lower half of the bow. When participating target archery, you will see that they have longer stabilizers. With the added weight, you can avoid a shooting problem that is to torque your hand at the shot. Stabilizers resist this torque to maintain accuracy. A bow stabilizer consists of four main parts that make up its construction. These are the screw mount, stabilizer body, noise dampening material, and weight. This is one of the most important attributes of a stabilizer. A dampener made of rubber is commonly used and is usually placed between the weight and the stabilizer body. The mechanism behind is when there is vibration; the vibration is transferred to the stabilizer and away from the bow then through the dampener to cancel out the vibration. Some best stabilizers have weighted front portion and are most efficient if positioned at the farthest end from your bow. The weight from that position provides counterbalance and stability to make your shot. Its role can be likened to a barrel attached to a rifle. The heaviness of the barrel helps maintain the rifle’s aim steady. When the vibration is transferred to the stabilizer and is eliminated by the rubber dampener, the front end is allowed to oscillate at a different frequency. The vibration is converted into motion and does not affect your bow. Aside from its balance, the weight helps the bow raise the moment of inertia. This is about an object resistance to rotation or torque. Having a high-quality stabilizer can make you maintain your shooting form. This article about the best bow stabilizersends here. Regardless of the brands presented, it is always up to the archer to choose what he thinks is the most comfortable with him. The products presented are assured to fit your preferences and your present situation; however, the only way to know is to try out a few products. Remember to put more thought into it, because a bow stabilizer can make your shot a big success or a big blunder.